Thailand is an independent country that lies in the heart of Southeast Asia. It is bordered to the north by Burma and Laos, to the east by Laos and Cambodia, to the south by the Gulf of Thailand and Malaysia, and to the west by the Andaman Sea and the southern extremity of Burma. Its maritime boundaries include Vietnam in the Gulf of Thailand to the southeast and Indonesia and India in the Andaman Sea to the southwest. One Tambon One Product (OTOP) is a local entrepreneurship stimulus program. The program aims to support the unique locally made and marketed products of each Thai tambon (subdistrict). If there is one must-see sight that no visit to Bangkok would be complete without, it's the dazzling, spectacular Grand Palace, undoubtedly the city's most famous landmark. Built in 1782 the Grand Palace of Bangkok is a grand old dame indeed, that continues to have visitors in awe with its beautiful architecture. Located in the north of the city the museum features a range of displays and exhibits providing details of Chiang Mai’s Lanna era. The museum documents northern Thailand’s pre-history to present times and includes examples of ancient jewellery, kilns from the 14th-century, ancient art and Buddha images alongside weapons of the era. The Hellfire Pass Memorial Museum is a MUST for anyone visiting the Kanchanaburi area to pursue their interest in the history of the Burma-Siam in World War II. The Death Railway Museum was a really well set up museum, it explains in great detail the building of the railway, the human cost of building it and also the reasoning behind its creation. The oldest and most traditional Thai resort combines the attractions of a modern holiday destination with the charm and fascination of a still active fishing port. And while most other Thai holiday destinations cater mainly to foreign tourists, Hua Hin is a holiday resort for foreigners and Thais. The Chao Sam Phraya National Museum in Ayutthaya is the second largest museum in Thailand. Its comprehensive collection of Thai religious art and artifacts makes it a must see in Ayutthaya. They are primarily from the Ayutthaya period and include impressive antique bronze Buddha images, carved panels, religious objects, and other local artifacts. Phuket, which is approximately the size of Singapore, is Thailand’s largest island. The island is connected to mainland Thailand by a bridge. It is situated off the west coast of Thailand in the Andaman Sea. 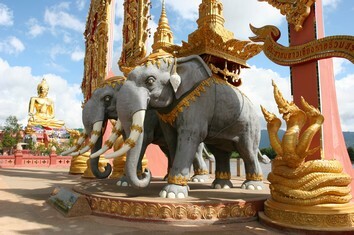 Phuket formerly derived its wealth from tin and rubber, and enjoyed a rich and colorful history. Ko Samui island of Surat Thani Province is an island off the east coast of the Kra Isthmus in Thailand, close to the mainland Surat Thani town. It is Thailand's third largest island, with an area of 228.7 km2 and a population of over 50,000 (2008). It is rich with natural resources, white sandy beaches, coral reefs and coconut trees. Just off Thailand’s south western coastal town of Krabi exists a unique, unspoiled tropical island: Ko Lanta Yai. With clear, cool waters and superb white sand beaches its paradisiacal appeal remains unmarred by mass tourism. The island also boasts a mountain range covered with rain forest. Nong Nooch, an ideal family holiday getaway, is a charming little village, minutes away from Asia’s most cosmopolitan beach resort – Pattaya. Nong Nooch’s Tropical Garden and Recreational Park offer sights and sounds that will be remembered for a lifetime. The fascinating Tropical Garden is beautifully landscaped and styled like a Thai village.